Nobody does greenhouse gas better than Greenpeace, or so they say. So imagine the wailing and gnashing of teeth in Berlin, figuratively speaking of course, when a study of theirs has indicated that Germany will â€œmiss by milesâ€ its ambitious plans to reduce its share of these gases by 40 percent. The study indicates that the current government plan can reduce emissions by 30 percent at the very most, and this primarily due to Germanyâ€™s equally ambitious plans to simultaneously increase its already large and dirty coal-burning power plant network. The German Ministry for the Environment rejected the results of the study as being â€œnicht nachvollziehbarâ€ (incomprehensible). Incomprehensible? Building more coal-burning power plants means producing more greenhouse gas? I donâ€™t see whatâ€™s so incomprehensible about that. But, then again, Iâ€™m not an expert. No one at the ministry was available for comment at the moment because half the building is on emergency leave in orderÂ to take advantage of the fabulous ski conditions down southÂ right now (thanks, Joe). Word is that this may be one of the very last times they will ever be able to go skiing in Germany again so they want to make the best of a bad situation as best they can. Of course that might be greenhouse gas, too. 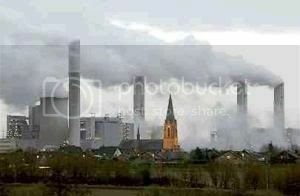 No user commented in " German Greenhouse Gas Galore "